It is not religion. It is an explanation of what motivates us and why. True Taoism is not a religion, but it has been combined with Chinese folk religion and Confucianism in some aspect in China and amoungst normal ethnic Chinese people, but in reality it is just a philosophy and way of explaining *things*. Lao Tzu one of its originators got completely fed up with explaining he could only point you, you had to find your way, so he just went off to where no one could find him to pursue *his way*. All Tao means is the way or the path, it is about creating balance and holding up a mirror to yourself and others. Around us is energy, we make ourselves aware of it by stilling all the chatter and noise in yourself, and then you react to the energy. No one should put up with abuse and bullying, turning the other cheek is not part of the way, which is why so many Chinese martial arts consider themselves to be Taoist Arts especially Tai-Chi Chuan/ Taijiquan. It’s beyond my understanding, it sounds like mysticism which I don’t trust and much of it is just made up, whereas God is real and our creator. I believe turning the other cheek is the right thing to do for both parties and in the end it creates a more stable psychological state for the wronged party. Why do these scoundrels persist? He has used a number of different names on TAS. I refer to him as fruitcake. All embracing and sums him up. Still doesn’t explain their motivation which just puzzles me. I don’t think they’ve been properly brought up by their parents which is a shame. As the late, great Mark E Smith put it: 'Can these people not understand, there's nothing worse than a bored man'. I’ve know idea who this Mark Smith is, but I understand the notion of what the devil does with those who have idle hands. Why some people choose to spend so much time on their keyboards criticising others I do not know. They must have very serious personality disorders. Well I did something very silly today which I now deeply regret. I decided never to go back but looked in horror at HFWW today and couldn't believe what an absolute shambles it is, and how the mods there seem to allow all manner of trolling and libel persist. Its supposed to be 'the new Wam' but its just the same as ever, cliques of horrid bullies ruining things for everyone else. At the moment it is allowed if I am the target. 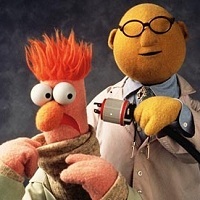 Well that’s just not cricket is it and jolly unfair Dr Bunsen. Who the hell do theses rotton bullies think they are anyway, and what have they got against you? It seems I have upset a few of them by telling the truth.